Like father, like son? Is survival under ocean acidification heritable? 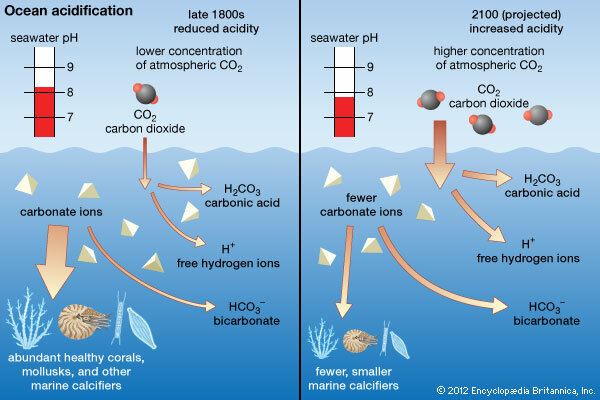 Ocean acidification (or the decrease of seawater pH values) is a serious threat to the environment. It is caused by the absorption of carbon dioxide (CO2) in seawater. This process can have several implications such as, for example, affecting the process of shell formation of many invertebrates. Oceans continue to absorb CO2 as human activities increase and release CO2 into the atmosphere. As a result, oceans had an approximate 30% increase in acidity since the Industrial Revolution (Figure 1). Figure 1: Changes in seawater chemistry from the 1800s to 2100 (projected) and impacts on marine calcifiers (organisms that deposit calcium salts in their body tissues) © Encyclopedia Britannica, Inc.
Observable characteristics of individuals (or their phenotype) are the result of the interaction of genes with the environment. It is important to understand the extent to which these characteristics are genetically determined and passed on to the offspring (or heritable) so that we can, for example, better predict the ability of organisms to adapt to environmental change. We know that different individuals of a same species have different abilities to adapt and survive under different conditions. But will the advantageous characteristics be passed on to their offspring? Some morphological characteristics as eye color are known to be highly heritable, meaning that parents and offspring will share strong similarity. However, it is not known how other characteristics such as survival to elevated ocean acidification are heritable. If an individual is more able to survive and reproduce under higher pH levels, will the offspring inherit this characteristic? In this study, Malvezzi et al. (2015) aimed to understand if differences in the offspring survival of the fish Menidia menidia under elevated CO2 conditions were due to genetic differences of the parents (also called heritability). For that, they collected 29 females and 42 males from the wild and reared the newly fertilized offspring at two different CO2 conditions: control and high CO2 dissolved. Each had 5 replicas and 1000 embryos per replica. The rearing containers with high CO2 conditions were siphoned twice daily to remove all dead individuals. After 15 days (the last two days there was no mortality of larvae), the experiment was terminated. The authors found that the number of offspring that survived under the high CO2 conditions were 34% significantly lower than the control (Figure 2). 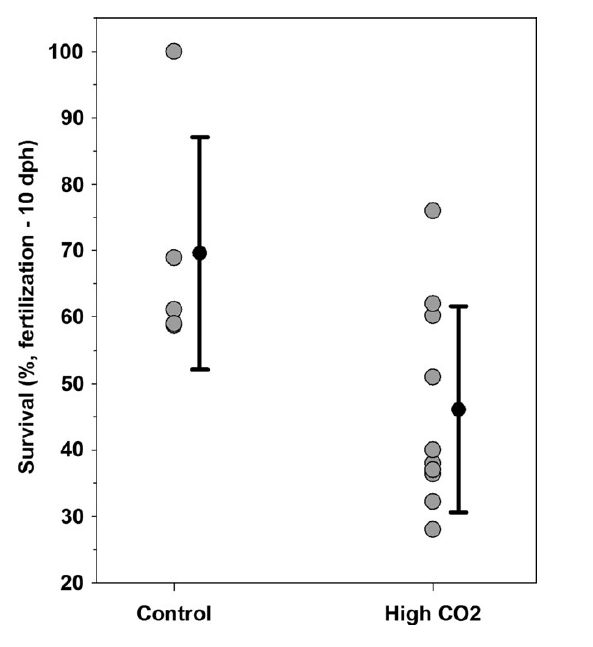 Figure 2: Survival of Menidia menidia offspring exposed to control (ambient – 460 μatm) levels of CO2 and high levels of CO2 (2300 μatm). The authors analyzed the DNA of both parents and offspring and used genetic markers called microsatellites to identify the parents of the larvae. They discovered that larvae that were genetically related survived just as long to high levels of CO2 (in other words, had similar phenotype). Malvezzi et al (2015) were also able to calculate the heritability value for survival under high CO2 conditions, which was 0.20 ± 0.07. This value is a proportion and can range from 0.0 (genes do not contribute to phenotypic individual differences) to 1.0 (genes are the only reason for individual differences). As there is a lack of estimates of heritability, it is difficult to relate to other works. Nevertheless, the heritability values calculated in the present study were notably above the study by Sunday et al, 2011 for a mussel and a sea urchin species that estimated values of heritability at high CO2 levels of 0.00 ± 0.00 and 0.09 ± 0.10, respectively. However, it is not well understood yet if these results mean that M. menidia will adapt relatively rapidly to ocean acidification. The potential to adapt rapidly is not only determined by heritability but also by the rate and direction of evolutionary change (or selection). 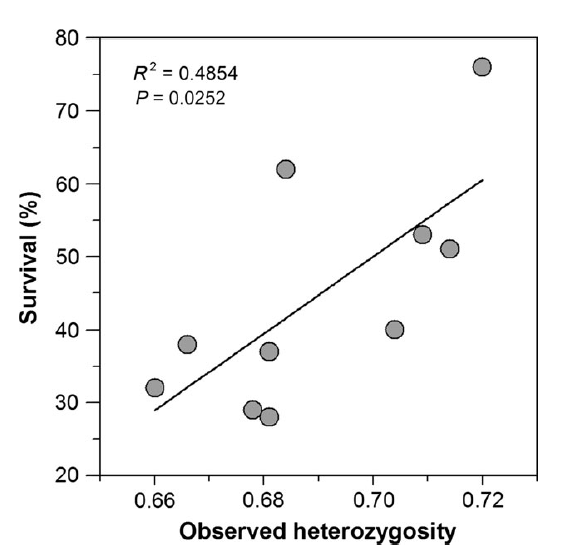 In addition, the authors found a positive relationship between genetic diversity (heterozygosity) and the early life survival at high CO2 levels (Figure 3). This is a very important finding as it highlights the importance of genetic variation for a population’s ability to adapt and persist under environmental change. Figure 3: Offspring survival at high CO2 levels in relation to genetic diversity (in terms of observed heterozygosity). To understand if organisms can adapt to ocean acidification, it is necessary to study the genetic basis of adaptation. Evolutionary change must occur quickly and in a specific direction in addition to the inherited characteristics that will be advantageous for individuals to adapt. This study emphasizes the importance of understanding the genetic basis of adaptation to environmental change, specifically to increasing levels of ocean acidification.